There's a lot to be said about the importance of community and how it relates to the success of a society. But, have you ever given any thought to how your hotel can create its own community within the company or even in a particular location? Running a successful hotel relies on the creation of a community amongst your staff. When your staff doesn't feel as if they are a central part of the team, then they are less likely to be at the top of their game. If you want your hotel's community to be a success, then you need to understand the importance of proper communication amongst your staff and support that effort at every opportunity. To assist you with accomplishing this, we've outlined some ways that you can use communication to create a sense of community within your hotel. You want to make sure that your employees are all on the same page so they can always service your guests to the best of their ability. A great way to do this is to have a daily or at least weekly communication pow-wow with the entire team, as time permits. Even just taking five or ten minutes with one or two groups can do wonders for morale and improve their sense of community. Most employees are perfectly okay with alterations to the way your hotel operates, because they expect changes to happen from time to time. Problems arise, however, when these changes are not properly communicated to them in an expedient manner. Be sure that all employees are notified of new policies or procedures as soon as you plan to put them into effect. Successful communities have always celebrated their accomplishments and the people who make everything possible. Be sure that you're recognizing how each employee has done his or her part to make guests happy and keep the hotel running smoothly. You may even want to start a monthly rewards program to give your employees something to strive for on a regular basis. Communication amongst your hotel's tight-knit workforce will never be sufficient if you don't have an open door policy. Your employees need to feel that they can come to you with any suggestions, concerns, or complaints without the fear of judgment or retaliation. Knowing that they can come to their boss will go a long way to creating both a sense of community and keeping up morale. One of the best ways to provide a sense of community throughout your hotel staff is to engage them outside of their work environment. Outdoor events that incorporate team-building exercises will help your staff come together as one central unit. If possible, schedule two separate events so that everyone can have a chance to go. These events can include business announcements as long as their primary focus is with the employees. You should never pass up the opportunity to allow your hotel staff to celebrate. 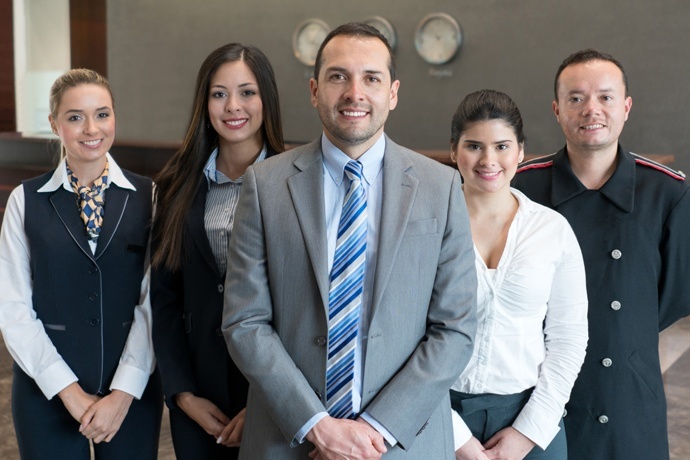 Whether you’re celebrating the birth of a child, the anniversary of an employee, or an accomplishment that the staff has helped your hotel achieve, these are the kinds of things that keep a lot of employees happy and content at their place of work. The community is which you live celebrates all types of thing, so why not follow its lead? Proper communication begins with a robust hotel VoIP phone system. If you're ready to upgrade your system, or have any questions about how a managed voice phone system can help you achieve success, please reach out to the professionals at Phonesuite today.